Who doesn't love a good story with a lot of fantasy and a hint of quirk? 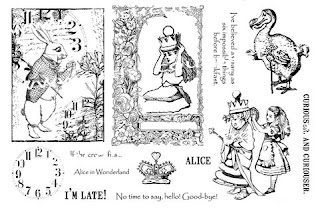 Artistic Outpost has pulled together some of the most zany iconic images from Lewis Carroll's Alice's Adventures in Wonderland and Through the Looking Glass, to bring to you a fun collaged set of Alice-themed stamps. 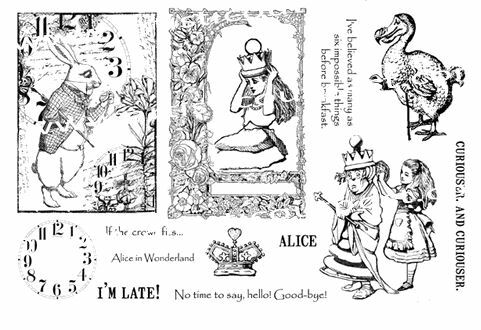 The Wonderland Collage Plate features unique images including the White Queen and the Dodo characters as well as an ATC sized White Rabbit Collage. This set is available at the Artistic Outpost Store in unmounted sheets and mounted on EZMount cling foam with indexed storage sheet. Today, I'm sharing two of the cards I created for this fun release! 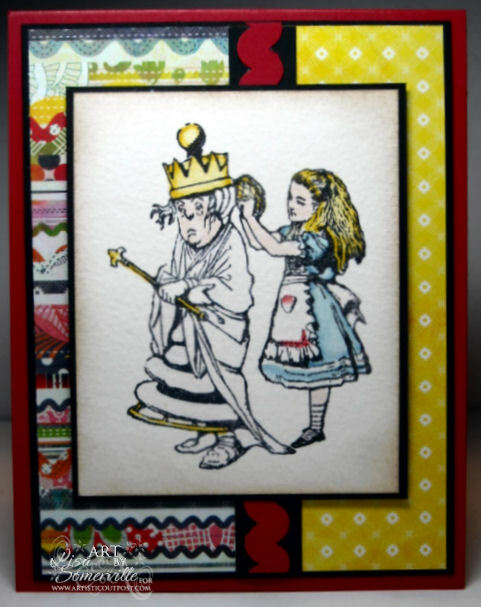 On this first card I stamped the White Rabbit Collage image in Black Archival, added a bit of coloring, and paper pieced his jacket using some Basic Grey pattern paper. 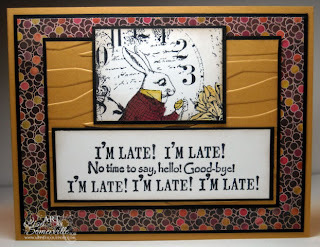 To create the sentiment I used a SAMJ for proper placement on repeating "I'm Late". This second card shows Alice combing the hair of the White Queen. The image is stamped in Black Archival, then colored using the Marker Watercoloring Technique. For the White Queen, I added coloring using Creative Inspirations Paint in Winter Frost, which gives the Queen a nice shimmer. I also added the paint to Alice's apron and socks. Thanks for stopping by, be sure to stop back tomorrow, I have another fun card to share using images from the Wonderland Collage and the Bird Die from Tim Holtz. Beautiful cards and love the stamps! Oh way kewl, I luv Alice! Great cards Lisa!!! This set I just might have to get, although I love a lot of theirs! what fun Lisa! I am so excited that Artistic Outpost came out with these! What great designs for the images! Love the paper and the images!